Beginning in 2007, LIVE has included Kristopher Apple, Dina Apple, Emily Aust, Liam Clancy, Anya Cloud, Viktor De La Fuente, Ron Estes, Eric Geiger, Allyson Green, Jess Humphrey, Zack King, Verónica Santiago Moniello, Justin Morrison, Blair Robert Nelson, Krista Kaye Nelson, Nhu Nguyen, Mary Peterson (formerly Mary Reich), Karen Schaffman, Leslie Seiters, Yolande Snaith, and Aubrhe Yruretagoyena. LIVE performed “in” Jennifer Steinkamp’s Madame Curie at the Museum of Contemporary Art, San Diego. Video by Rebecca Salzer. Excerpt from an informal performance we did for Joe Alter’s Aesthetics & Criticism class at SDSU. Fall, 2014. Excerpt from our performance in Landau, Germany in 2011. These are excerpts of me in various LIVE performances in San Diego, Tijuana, and Los Angeles during 2009 & 2010. This is Karen, Leslie, me, and Mary in practice. This is a performance where there were only a few of us in town, and we did a two-camera shoot with iPhones using a zip tie for one of them. LIVE is a group of artists with whom I have been practicing every Thursday for the past 10+ years. What we do was initially inspired by Barbara Dilley’s Contemplative Dance Practice. We used to sit for 20 minutes, solo warm-up/tuning for 20 minutes, group warm-up/tuning for 20 minutes, and then we took the last hour or so to make something…practice, perform, practice performing, audience, compose, improvise, sing, play, “play”, dance, dance, dance, talk, touch, try to do nothing, witness, scream, get naked, all or none of the above. It’s pretty rare that it goes exactly like that, but some configuration of those pieces happened every Thursday. After a few hours of that, we ate lunch and discussed/argued/reveled in whatever happened. A few years in, we decided to attempt to practice in front of an audience. We performed 15 times or so in three countries. Our score usually involved some kind of clock or alarm to let us know when an hour or so had passed. Otherwise, the work was made in the moment supported by our shared history. Performance practices were followed by dinner and discussions/arguments/revelries. We (Leslie, Eric, and Jess) invite you to join us in a weekly practice. This practice has a nearly decade-long history that we imagine will be fully present in the room, and also invites the inevitable shifts that will occur when new artists join us. It’s been called many things, but mostly it is called LIVE. Its structure has evolved over time: sometimes lightly prescribed, always something to be in relationship with, but never a set of rules that everyone is expected to follow. Over time, LIVE has included Kristopher Apple, Dina Apple, Liam Clancy, Anya Cloud, Ron Estes, Eric Geiger, Allyson Green, Jess Humphrey, Justin Morrison, Blair Robert Nelson, Karen Schaffman, Leslie Seiters, Yolande Snaith & Mary Reich. 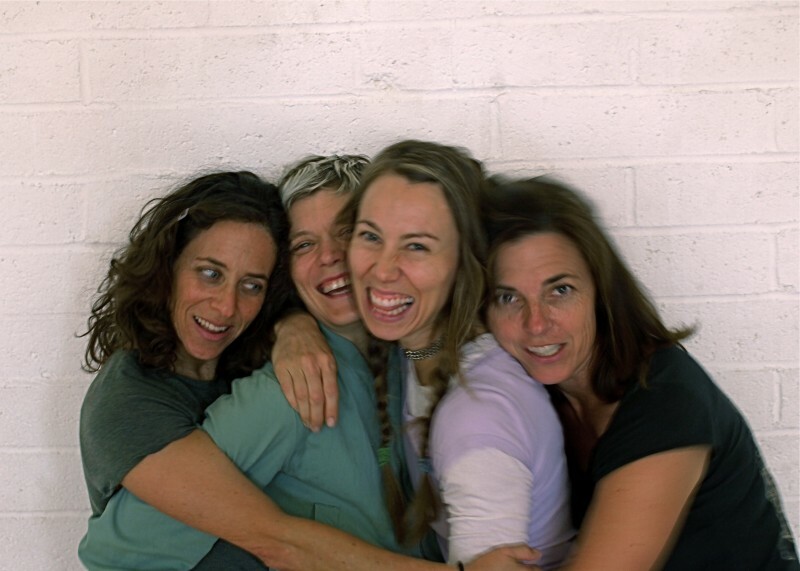 The LIVErs have changed over time, with almost all of them moving on from or stepping out of the practice by 2015, when Eric, Jess, and Leslie spent nearly a year practicing as a trio. You all know Eric’s circumstances, and while those have kept him out of the studio over the past year, he has not left the practice and has been instrumental in the articulation of this new phase. He is working to clear Thursday mornings to be in practice with us again. Justin, Liam, Yolande, and Ron have returned to the practice this past fall. Power. Who, when, where, & what kind of power? How do we ensure that those with less power have a voice? Recognition of diversity, homogeneity, and the forces at play in both. Privilege: How do different kinds of privilege determine who is in the room and a part of our practice? Structure…how are we in relationship with it? What is the structure that emerges and can we pay attention to that while being a part of it? How does the structure choreograph the practice? How is our role in shaping the structure different than others’? Communication = How can we be clear in order to avoid misunderstandings and unrealistic expectations without sacrificing the creative potentials that exist within the unknown/unstable/blurry/chaotic? What is transparency? When is it helpful? Willfulness and Permeability- What if these develop in equal proportion? Being full-of-care and not “careful”- What if these develop in equal proportion? You have to be present to shape the practice, and when you’re absent, you are still there. A group that is not aimed at anything in particular where individual aiming is fully supported. What happens when we bleed between phases of practice, practice and conversation, practice and daily life, and practice and performance? How are we in relationship with rules/patterns/habits/tendencies/”shoulds”? Can we make space for trying stupid things, obvious things, things that “should not work”? What happens when we include feeling, sensing/sensation, sense-making and nonsense? What if we re-engage in the same room with same persons over time and still believe in and/or rely on ever-more possibility within this limitation? When I see you, you could be anyone (and more and more I also get to know you as you). Thursday mornings, 9am-11am (option to continue till 11:30am). First “season” is March, April, & May. 45 minutes: We make something together. 30 minutes: We talk about what happened. 30 minutes: bleed/spill time for documentation, writing, posting, listing, bullshitting (or leaving for those that need to get on to next thing). Performances happen every week as we practice. Performances outside of that context might happen. These performances would be approached in ways that serve and share the practice rather than the practice being intentionally altered to prepare for them. We are starting with only those on this email, and plan to revisit the possibility of inviting more folks after this first “season”. We hope this will give us all time to develop some shared history and listen to the practice itself for the next steps. Below are photos taken by TEO (photographer Tim Richards) during performances. I am so grateful for his presence in the community and his beautiful photos.